New rules from the EPA thousands of companies will no longer have to publicly disclose when they release toxic chemicals. Some companies were required to report the release of 500 pounds or more of certain chemicals. The new rule raises the reporting requirement to 2000 pounds. type in your zip code on the EPA’s Toxic Release Inventory website. release 2000 pounds or more. is expected to take a closer look at the new rule in its next session. executives have not said when that vehicle will be on the road. recycling company. The leftovers are then trucked out a compost facility. stuffed in large black bags, 200 feet long and 10 feet wide. started in the trash business almost 15 years ago and he says it has come a long way. harvest, sometimes as much as three times a year. “And we just always do that. I don’t even have to. Roberto’s our tractor driver. but he likes the idea this fertilizer comes from restaurants. Hale says they use compost between the rows, to prepare the land for winter. plants, and healthy plants she says are better able to fend off pests and disease. about what might have gone into the compost. Montgomery calls it fertilizer with pizzazz. The smaller American chestnuts on the left were a part of culture for people who lived in hardwood forested areas of the U.S. The Chinese chestnuts on the right are not susceptible to the blight. Nash Nursuries in central Michigan is home to a rare sight, a grove of American chestnuts. 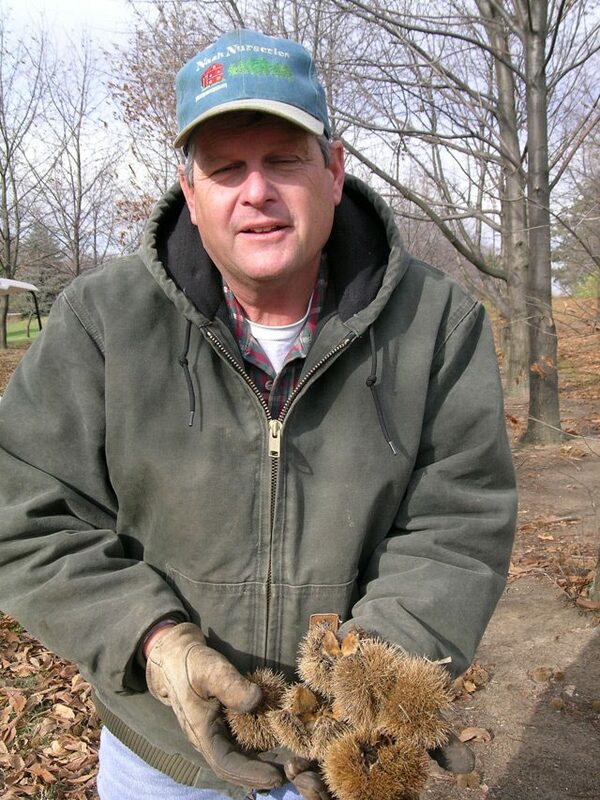 Owner Bill Nash shows the chestnuts still in their prickly husks. wiped out the American chestnuts. Now, they’re gone. And, in a few isolated pockets in the Midwest, the blight hasn’t reached the trees. rare sight… a grove of American chestnuts. In a few places in Michigan and Wisconsin there are small groves of chestnuts. overcomes the blight that’s hit it so hard. 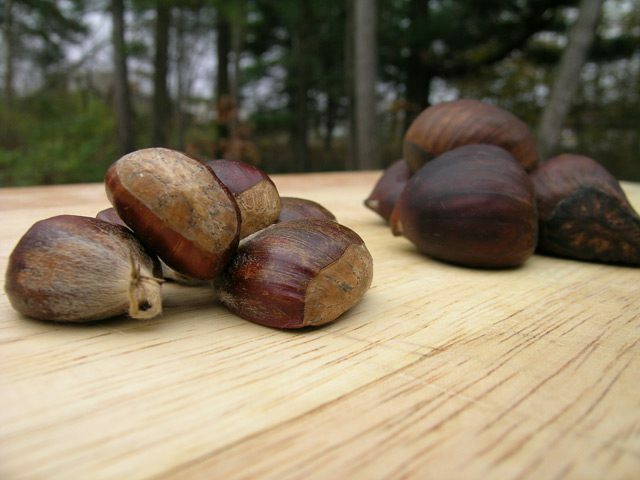 of chestnuts has been hard on wildlife populations. chestnuts and still keep the resistant genes. releasing a genetically modified organism into the wild. working to keep the blight at bay. eastern third of the country, we obviously can’t treat every canker on every tree. the American chestnut holds the place it once did in the forests. optimistic about the American chestnut. Seems Frost was an optimist too. The Coast Guard had wanted to establish 34 “live fire” zones across the Great Lakes. The proposal ran into opposition partly involving concerns over the potential environmental impact. Michigan Congressman Bart Stupak says thousands of rounds of spent ammunition would have been dumped onto the bottom of the Great Lakes. In a written statement, the Coast Guard said it would reconsider its “live fire” proposal, including the location of water training areas and the use of “environmentally friendly alternatives to the lead ammunition” currently used. Congressman Stupak says it will probably be several years before the Coast Guard tries to put forward a new “live fire” proposal. The US EPA is letting California require highly polluting small engines to be sold with catalytic converters that cut smog emissions by roughly 40%. Wisconsin-based engine maker Briggs and Stratton, and politicians who represent some communities with Briggs factories, had fought California’s regulation. They contended it would be hard to make one set of engines for California and another for the rest of the country. But company vice-president Tom Savage says Briggs has been anticipating the regulation and can handle it through segregating the firm’s inventory. Savage says they’d already been expecting the EPA to require tougher pollution controls on small engines nationwide over the next one to five years.